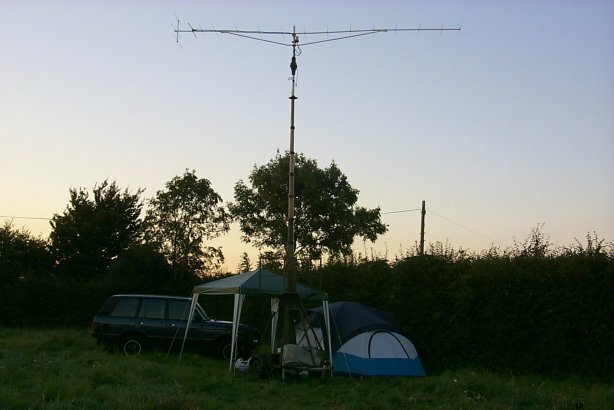 We arrived at site on the Friday evening to pitch the tent (£59 from Tesco) and set-up Harold, our mobile Clark mast. It was very damp and drizzly, but the weather steadily improved over the weekend and I ended-up with my usual NFD hay fever by the Sunday morning! It was great to welcome Peter G3BPM who stayed the whole of Saturday and enjoyed the opportunity to talk “radio”. We were also delighted to have Vaughan G7AIC join us for the duration. VHFNFD runs from 1400hrs UTC on the Saturday for 24 hours. There was an excellent lift through to Sunday morning on 2m and conditions into Germany were particularly favourable. 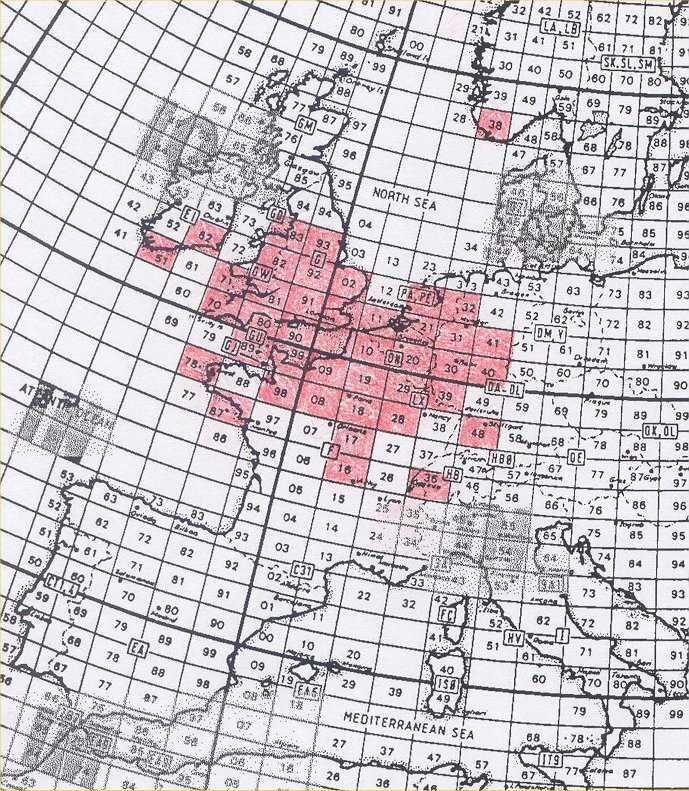 Best DX was EA1FDI/P who we worked right at the start of the contest, a distance of 995Km. The weekend was Tone’s first opportunity to sample 2m DXing and she spent time listening while Vaughan and I took coffee breaks. 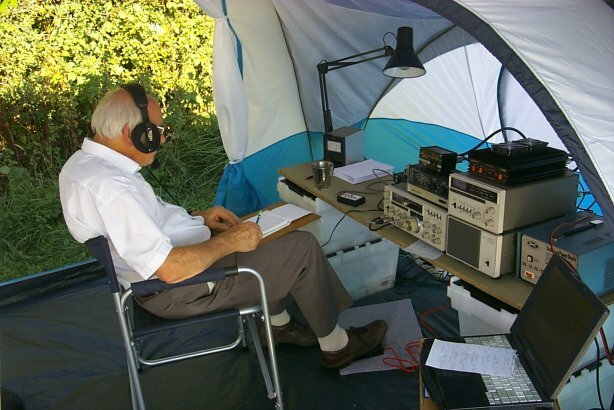 Second best DX was spotted by Tone, HB9MM/P at a distance of 832Km, which had Vaughan diving through the tent to work it! We made a total of 201 QSOs which was down on what we had hoped. This was for two reasons, namely (i) several generator outages due to water in the petrol and (ii) we all took a few hours nap on Saturday night. The main station was active on 2m, but we also had a facility for 70cm and worked EA1FDI/P on that band as well with 59 signals. Interestingly, we left the Tonnas pointing SE for most of the contest and the locator squares that we worked reflected this. 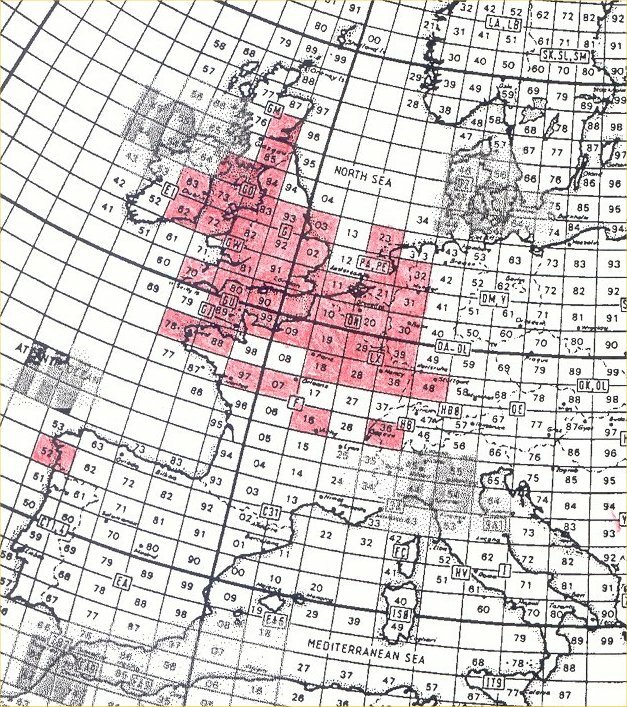 We should have spent more time pointing northwards as we didn’t work that many UK stations, but the tropospheric lift into the Continent was just too irresistable. We learnt a few lessons and identified a few problems to address before the next contest. Ignition noise from the generator proved to be a nuisance throughout - we had to use the noise blanker for most of the time, which improved the FT-107's handling of strong signals immensely! Didn't bother with a rotator for the beam because we planned to use the "armstrong" method - this was a mistake because we tended not to move it and so didn't systematically work all areas. We set-up the station on Saturday morning, ready for a 1400hrs start. Peter G3BPM once again joined us for the day and helped-out with the operating in the early stages of the contest. We had brought a rotator with us this time and a quick swing around the beacons before the start revealed fairly good paths in all directions. QSO rate per hour was quite even during the first part of the contest and Tone (now licensed as M3VBH) had her first chance to operate. She was really pleased to work the best DX of the day, DK5DQ in JN48EQ which was a distance of 855Km. However, her elation was short-lived. CQ calls by Adrian on the Sunday morning suddenly produced HB9Y down in JN36ME at a distance of 907Km. Probably ducting as we heard several good signals from that direction. The icing on the cake shortly followed, when a CQ call beaming NE produced a 59+ signal from LA2PHA who is in JO38IB, a distance of 1014Km. Think this was Sporadic E because we didn't hear anything else from that direction (and never heard LA2PHA again after the QSO). Where were the GMs? Although we spent time with the beam pointing that way we didn't hear a single station from Scotland and the furthest we worked in that direction was IO83 and IO93. If anyone ever needed justification for retaining CW, they would have received it during the contest. 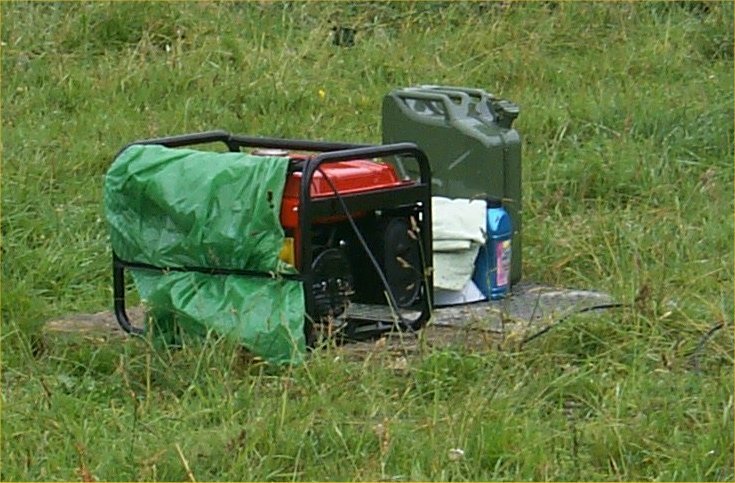 On eight different occasions we tried calling DX stations, but with our limited power of 100W (valve amplifier still not available) they were not hearing us. Switched to CW and they heard our call instantly. 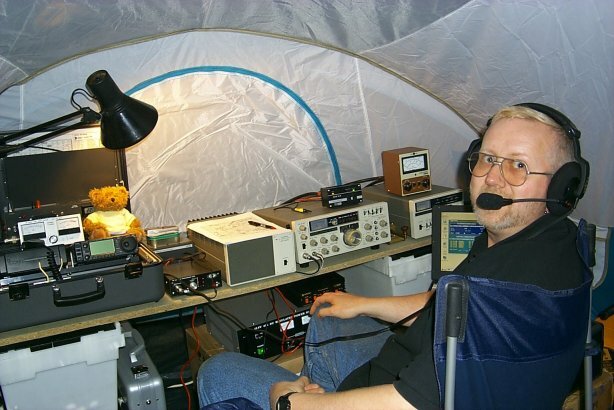 One of these cross-mode contacts produced much amusement as the operator we were contacting clearly didn't read Morse and he had left his microphone on VOX, while his friends woke-up another operator and dragged him into the tent! Due to the lack of additional operators at Combe Beacon and the need to get home at a reasonable time on Sunday, we closed the station at mid-day having made 159 contacts (the log shows 158 serial numbers issued because it glitched on Sunday morning and allocated serial number 100 to two contacts). The QSO rate had dropped considerably by Sunday lunchtime anyway.